I think beets get a bum rap. I admit the staining power of red beets can be a little off-putting. I can understand that the slightly earthy taste, which I really like, would turn some people off. However, I’d like to make the case that if well-prepared and combined with other ingredients, they are quite delicious. Aside from being delicious, beets possess many health-producing characteristics. They are high in vitamins A, B, C, beta carotene, and potassium. Beets are an effective tonic for the liver and have many blood-cleansing properties. If you’re opposed to red beets, I suggest golden beets as a great alternative. Goat cheese is the perfect companion to the sweet flavor of the beets. 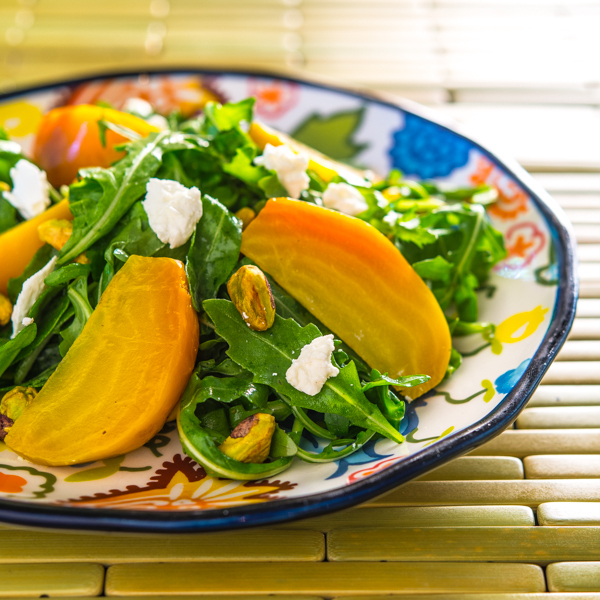 Add some pistachios and arugula and top with a lemon vinaigrette and you’ve got a scrumptious salad. Thanks so much fagain r the feedback, Anna! So glad you enjoyed the recipe! Just tried this today! I served it with grilled shrimp and black bean soup. Words cannot describe how delicious this combination of flavors was in this salad! Can’t wait to try this. ❤️ Beets!!! I love beets! But where did you find these orange ones? Beautiful photo and scrumptious salad pairings! Beautiful plate with lovely colors. We love beets and I am so glad, they are damn healthy. I really like beets, particularly roasted and then used in a salad. I usually use the red ones, though, not the goldens – need to try that. And beets and goat cheese is an incredible combo. Really good recipe – thanks. This salad is simply GORGEOUS!! And my husband loves beets and salads so it is one I really need to make for him. Pinned.